Addicted to movies? You can watch video on your tablet, smartphone, or portable media player, of course--but since none of those gadgets have optical drives, you can't put any of your DVDs into them. Although new disc releases with Digital Copy come with one free digital version of the movie, you need some outside help for dealing with DVDs that were released before Digital Copy became mainstream. Here's how to use the HandBrake application to rip copies of your DVDs into whatever format you like, so you can play the movies wherever and however you want. Disclaimer: To rip encrypted DVDs, you'll need the DVD43 plug-in, which circumvents the publisher's digital rights management technology. Such procedures currently occupy something of a legal gray area. You probably won't face any legal consequences if you simply rip your legally purchased movie collection for your own use, but we're just going to present the instructions and let you decide for yourself whether to follow the steps. PCWorld is not responsible for any damages that result from this how-to. 1. 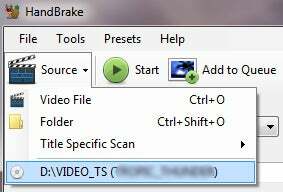 Download and install HandBrake. This open-source video transcoder is free, and available for Windows, Mac, and Linux. HandBrake is a free, user-friendly application that lets you rip DVDs to your PC. 2. If you are looking to rip an encrypted DVD, grab a DVD decrypter such as DVD43 to circumvent the built-in disc restrictions. 3. When you launch the HandBrake program, click the Source button and select the DVD from the drop-down menu. HandBrake will then scan the disc for titles to copy. This step can take some time, depending on how much data is on your disc. 4. When HandBrake has finished its scan, click the Title drop-down menu to choose the section to copy. This step can involve a bit of trial and error; generally speaking, though, if you want to rip the main movie, select the title with the longest run time. Otherwise, you might end up with a rip of the previews or the menu screen, but not the actual movie. When in doubt, rip the longest title--that's most likely the actual movie, not the trailers or special features. 5. Next, look at HandBrake’s preset menu on the right side. It has a list of preset outputs for a slew of Apple devices (which tend to be finicky about the kinds of movie files they'll play). If you don't intend to use any of the game consoles or iOS devices included in the presets, you can manually arrange your own settings by choosing Normal or High Profile. 6. The Video tab lets you fine-tune your project, and has some options that will allow you to adjust the final quality of your movie. Just remember that the higher the quality, the larger the file size. If your device is short on storage space, try the Target Size option to have HandBrake rip to your storage requirements. 7. You can tweak the audio quality under the Audio tab. Here you can select different bit rates and Dolby processing, but the default settings are often good enough. 8. If you are ripping more than one title, click Add to Queue; otherwise, click Start, and watch the magic begin. For more tips on using HandBrake to manage your media collection, read "Automate Your PC's Media Library."